This is the development page for the callsign lookup action. A front-end that performs lookups of U.S. amateur radio callsigns against the FCC database. 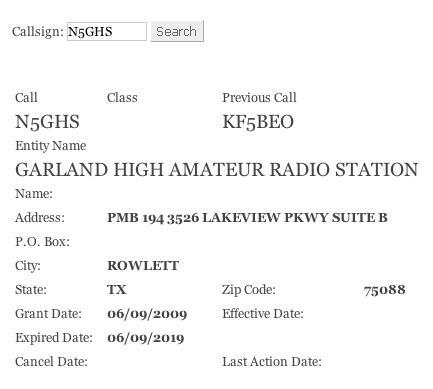 This action requires a local DB copy of the FCC amateur radio callsign database (files are available from the FCC; see below for instructions). Download the FCC weekly database (the "Licenses" link under "Amateur Radio Service" on the right sidebar). Only certain tables (AM, EN, HD) are used for this action. I've posted a perl script that performs the necessary table and field creations. If you choose to roll your own, read the comments at the start of the script for the fields that are required.